The BlackBerry 10 release date is less than two months from today, so smartphone developer Research In Motion is demoing how its touchscreen keyboard is going to make fans feel right at home. 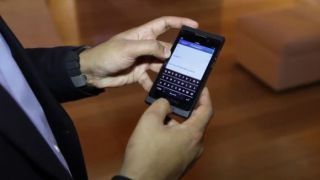 "We've really played close attention to make it look and feel like a BlackBerry keyboard," said RIM Head of Software Portfolio Vivek Bhardwaj in a video interview on the company's official blog. The visual design of the BB10 keyboard is complete with familiar white letters on top of black keys and BlackBerry's famous white frets between the keys. "You have a look at each key," said Bhardwaj. "It's kind of maximized edge-to-edge." RIM also has new predictive typing features in the BlackBerry 10 OS that may help the company remain known for its stellar smartphone keyboard and achieve its goal of becoming the No. 3 mobile OS. "When it comes to next-word suggestions," said Bhardwaj, "they're personalized with your own vocabulary." Next-word suggestions appear right on the keys, and a simple swipe-to-type gesture adds the predicted word. There's no tiny little X button to deal with like on the iPhone 5. The BlackBerry 10 keyboard takes typing convenience a step further with innovative predictive spacing. "When rushing out and typing a lot of words, and you miss that space key, with BlackBerry 10 we recognize that," said Bhardwaj. The phone will infer that space and drop one in automatically. No word on how this predictive spacing function will treat hashtags, however. Bhardwaj calls this his favorite BlackBerry keyboard feature, saying, "the largest key on the keyboard is space, but [on touch] it's something that we miss very often just because of the speed we're typing at." "When you type two, three, even four words, and you've missed the space, you don't stop, you don't need to look back. We'll correct all of that for you and you just continue typing."